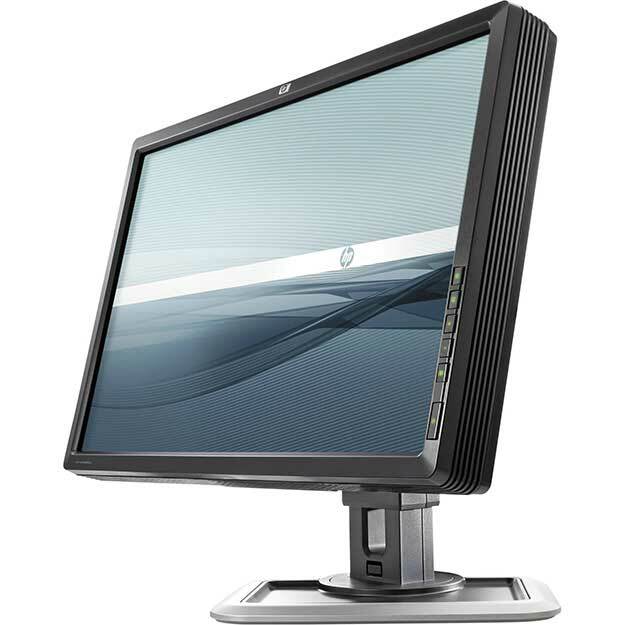 HP revolutionized the world of color critical displays with the release of the first Dreamcolor display in June 2008. The LP2480zx was a 24″ 1920×1200 display, that had built-in color processing with profiles for standard color spaces, and the ability to calibrate it to refine those profiles as the monitor aged. It was not the first display with any of these capabilities, but the first one that affordable, by at least an order of magnitude. It became overwhelmingly popular in the film industry, both sitting on desks in post-production facilities as it was designed to, and out in the field, as a live camera monitor, which it was not designed for. It had a true 10 bit IPS panel, and the ability to reproduce incredible detail in the darks. It could only display 10 bit sources from the brand new DisplayPort input or the HDMI port, and the color gamut remapping only worked for non-interlaced RGB sources. So many people using the Dreamcolor as a “video monitor” instead of a “computer monitor” weren’t even utilizing the color engine, they were just taking advantage of the high quality panel. It wasn’t just the color engine, but the whole package and the price that led to its overwhelming success. This was helped by the lack of better options, even at much higher price points, as this was the period after CRT production ended, but before OLED panels had reached the market. This was similar to (and in the same time frame as) Canon’s 5D MarkII revolutionizing the world of independent filmmaking, with the HDSLRs. The combination gave content creators amazing tools for moving into HD production at affordable price points. It took six years for HP to release an update to the original model Dreamcolor, in the form of the Z27x and Z24x. These had the same color engine but different panel technology. They never had the same impact on the industry as the original, because the panels didn’t wow people, and the competition was starting to catch up. 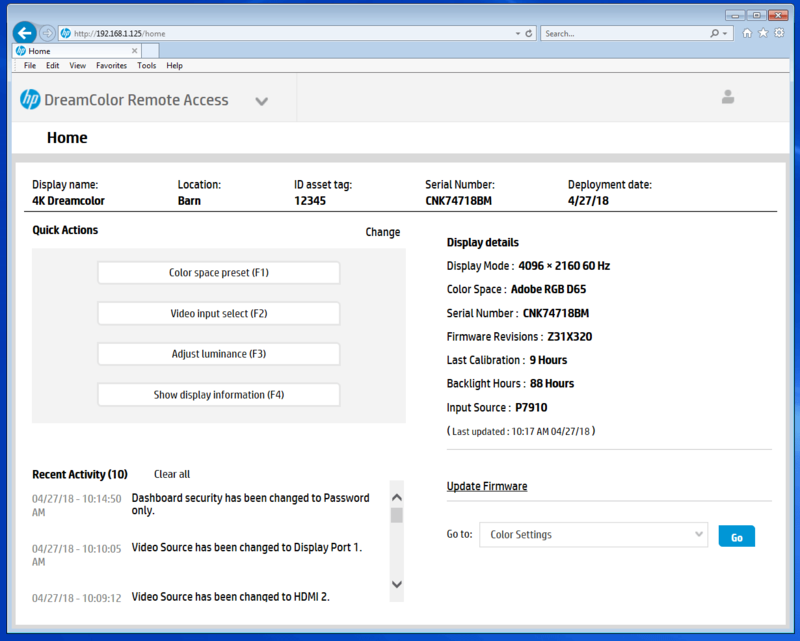 Dell has PremierColor, and Samsung and BenQ have models featuring color accuracy as well. The Z27x could display 4K sources by scaling them to its native 2560×1440 resolution, while the Z24x’s resolution was decreased to 1920×1080, with a panel that was even less impressive. Fast forward a few more years, and the Z24x was updated to Gen2, and the Z32x was released. with UHD resolution. This was four times the resolution of the original Dreamcolor, at half the price. But with lots of competition in the market, I don’t think it has had the reach of the original Dreamcolor, and the industry has matured to the point where people aren’t hooking them to 4K cameras, because there are other options better suited to that environment, specifically battery powered OLED units. And this brings us to today, with HP’s release of the Z31x Dreamcolor Studio Display. The big feature that this unit brings to the table is true cinema 4K resolution. The label 4K gets thrown around a lot these days, but most “4K” products are actually UHD resolution, at 3840×2160, instead of the full 4096×2160. This means that true 4K content is scaled to fit the UHD screen, or in the case of Sony TVs, cropped off the sides. When doing color critical work, you need to be able to see every pixel, with no scaling, which could hide issues. So the Z31x’s 4096×2160 native resolution will be an important feature for anyone working on modern feature films, from Editing and VFX to Grading and QC. 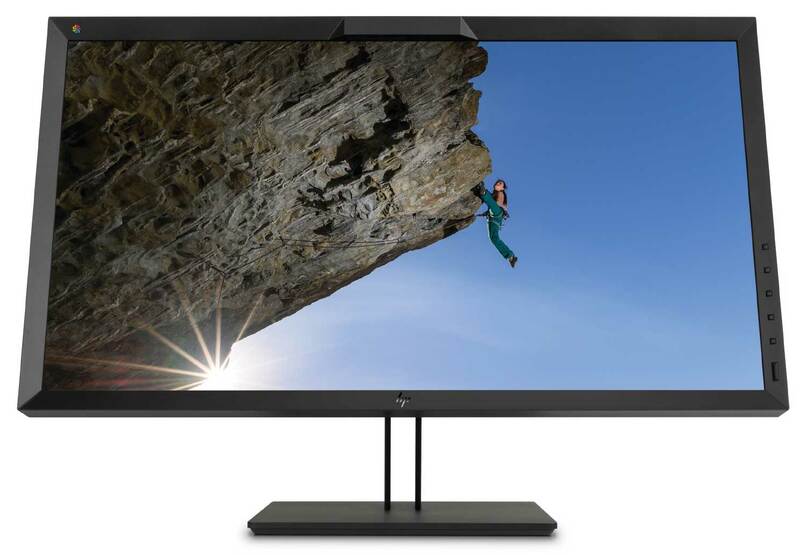 The true 10bit IPS panel is the cornerstone of what makes a Dreamcolor such a good monitor. IPS monitor prices have fallen dramatically since they were first introduced over a decade ago, and some of that is the natural progression of technology, but some of that has come at the expense of quality. 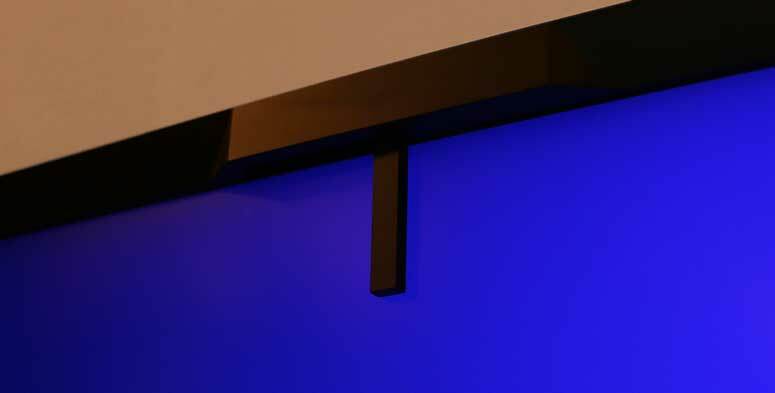 Most displays offering 10bit color are accomplishing that by flickering the pixels of an 8bit panel in an attempt to fill in the remaining gradations with a technique called FRC (Frame Rate Control). And cheaper panels are as low as 6bit color, with FRC to make them close to 8bit. There are a variety of other ways to reduce cost with cheaper materials, and lower quality backlights. HP claims that the underlying architecture of this panel returns to the quality of the original IPS panel designs, but then adds the technological advances developed since then, without cutting any corners in the process. In order to fully take advantage of the 10bit panel, you need to feed it 10bit source content, which is easier than it used to be, but not a forgone conclusion. 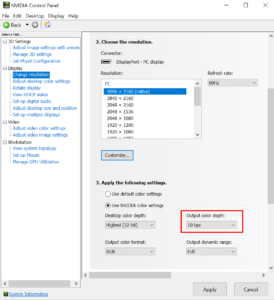 Make sure you select 10bit output color in your GPU settings. Besides true 10bit color display, it also natively refreshes at the rate of the source image, from 48-60hz, because displaying every frame at the right time is as important as displaying it in the right color. They say that the darker blacks are achieved by better crystal alignment in the LCD (Liquid Crystal Display) blocking out the backlight more fully. This also gives a wider viewing angle, since washing out the blacks is usually the main issue with off-axis viewing. I can move about 45 degrees off center, vertically or horizontally, without seeing any shift in the picture brightness or color. Past that I start to see the mid levels getting darker. The other new headline feature is an integrated colorimeter for display calibration and verification, located in the top of the bezel. It can swing down and measure the color parameters of the true 10bit IPS panel, to adjust the color space profiles, allowing the monitor to more accurately reproduce colors. This is a fully automatic feature, independent of any software or configuration on the host computer system. It can be controlled from the display’s menu interface, and the settings will persist between multiple systems. This can be used to create new color profiles, or optimize the included ones for DCI P3, BT.709, BT.2020, sRGB, and Adobe RGB. It also includes some low blue light modes for use as an interface monitor, but this negates its color accurate functionality. It can also input and output color profiles and all other configuration settings through USB and its network connection. There are five main display inputs on the monitor: two Displayport 1.2, two HDMI 2.0, and one Displayport over USB-C. All support HDCP, and full 4K resolution at up to 60 frames per second. It also has an 1/8″ sound jack, and a variety of USB options. There are 4 USB 3.0 ports that are shared via KVM switching technology between the USB-C host connection and a separate USB-B port to a host system. These are controlled by another dedicated USB keyboard port, giving the monitor direct access to the keystrokes. There are two more USB ports that connect to the integrated Dreamcolor hardware engine, for connecting external calibration instruments, and for loading settings from USB devices. My only complaint is that while the many USB ports are well labeled, the video ports are not. I can tell which ones are HDMI without the existing labels, but what I really need is to know which one the display views as HDMI1, and which is HDMI2. The Video Input Menu doesn’t tell you which inputs are active, which is another oversight, given all of the other features they added to ease the process of sharing the display between multiple inputs. So I recommend labeling them yourself, and this is the configuration. I expect the Z31x will most frequently be used as a dedicated full resolution playback monitor, and HP has developed a bunch of new features that are very useful and applicable for that use case. The Z31x can overlay mattes (with variable opacity) for Flat and Scope cinema aspect ratios (1.85 and 2.39). It also can display onscreen markers for those sizes, as well as 16×9 or 3×4, including action and title safe, including further options for center and thirds markers, with various colors available. The markers can be further customized with HP’s StudioCal.XML files. I created a preset that gives you 2.76:1 aspect ratio markers that you are welcome to download and use or modify. 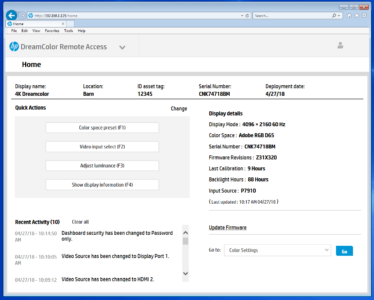 These customized XMLs are easy to create, and are loaded automatically when you insert a USB stick containing them into the color engine port. The display also gives users full control over the picture scaling, and has a unique 2:1 pixel scaling for reviewing 2K and HD images at pixel for pixel accuracy. It also offers compensation for video levels and overscan, and controls for de-interlacing, cadence detection, panel overdrive, and blue channel only output. You can even control the function of each bezel button, and their color and brightness. These image control features will definitely be significant to professional users in the film and video space. Combined with the accurate reproduction of color, resolution, and frame rate, this makes for an ideal display for monitoring nearly any film or video content at the highest level of precision. Most people won’t be using this as an interface monitor, both due to the price, and because the existing Z32x should suffice when not dealing with film content at full resolution. Even more than the original Dreamcolor, I expect it will primarily be used as dedicated full screen playback monitor, and users will have other displays for their user interface and controls. That said, HP has included some amazing interface and sharing functionality in the monitor, integrating a KVM switch for controlling two systems on any of the five available inputs. They also have picture in picture and split screen modes that are both usable and useful. HD or 2K input can be displayed at full resolution over any corner of the 4K master shot. 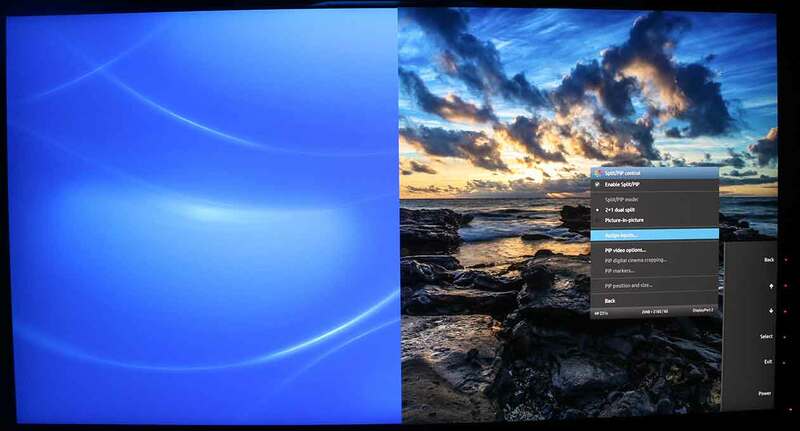 The split view supports two full resolution 2048×2160 inputs side by side from separate sources. That resolution has been added as a default preset for the OSes to use in that mode, but it is probably only worth configuring for extended use. (You won’t be flipping between full screen and split very easily in that mode.) The integrated KVM is even more useful in these configurations. It can also scale any other input sizes in either mode, at a decrease in visual fidelity. They have included every option that I could imagine needing for sharing a display between two systems. The only problem is that I need that functionality on my “other” monitor for the application UI, not on my color critical review monitor. When sharing a monitor like this, I would just want to be able to switch between inputs easily, to always view them at full screen and full resolution. On a related note, I would recommend using DisplayPort over HDMI anytime you have a choice between the two, as HDMI 2.0 is pickier about 18Gb cables, occasionally preventing you from sending RGB input, and other potential issues. The monitor has an RJ-45 port allowing it to be configured over the network. Normally I would consider this to be overkill, but with so many features to control, and so many sub-menus to navigate through, this is actually more useful than it would be on any other display. I found myself wishing it came with a remote control as I was doing my various tests, until I realized the the network configuration options would offer even better functionality than a remote control would have. I should have configured that feature first, as it would have made the rest of the tests much easier to execute. It offers simple HTTP access to the controls, with a variety of security options. The Dreamcolor Z31x is expected to retail for $4000 in the US market. If that is a bit out of your price range, the other option is the new Z27x G2, for half of that price. While I have not tested it myself, I have been assured that the newly updated 27″ model has all of the same processing functionality, just in a smaller form-factor, with a lower resolution panel. 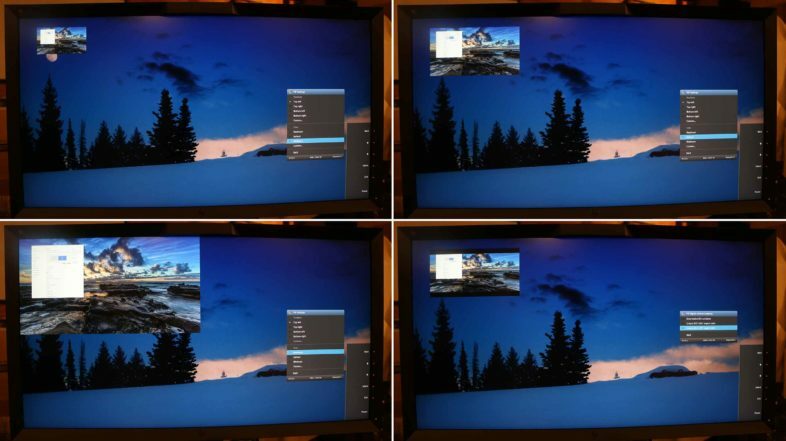 The 2560×1440 panel is still 10bit, with all of the same color and frame rate options, just at a lower resolution. They even plan to support scaling 4K inputs in the next firmware update, similar to the original Z27x. The new Dreamcolor Studio Displays are top quality monitors, and probably the most accurate SDR monitors in their price range. It is worth noting that with a native brightness of 250 nits, this is not an HDR display. While HDR is an important consideration when selecting a forward looking display solution, there is still a need for accurate monitoring in SDR, regardless of whether your content is HDR compatible. And the Z31x would be my first choice for monitoring full 4K images in SDR, regardless of the color space you are working in.